IT'S GAME DAY!! 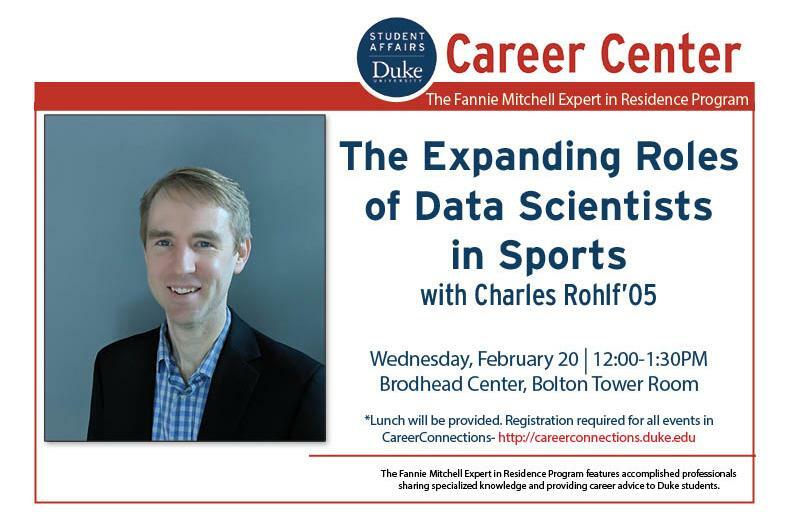 And what better way to kick-off the celebration than with free food and conversation with Duke alum, Charlie Rohlf'05, Sr. Director, Basketball Technology and Products at National Basketball Association (NBA). Get inside info. about the major aspects of the sports industry, skills you can be developing to stand out, and ways to enter the field. Charlie will also discuss his professional career path and how he landed a role at the NBA. Finally, you will learn about how data science can prepare you for future roles and where the sports industry could take you! After graduation, he spent a few years trading currency options at the Chicago Mercantile Exchange during the day while coaching high school golf and basketball in the evenings. While pursuing his Master's degree in Computer Science from DePaul University in Chicago, Charlie took a full time role as a teacher and technology coordinator with the high school where he was coaching. He completed his Master's degree in 2012 after finishing a thesis on using computer vision to track the movement of the basketball in videos of high school basketball games. This led to Charlie joining STATS LLC as a computer vision engineer working on the SportVU tracking system. Charlie eventually switched to the business side of STATS when he was tabbed to lead SportVU and Basketball products. *Register by clicking More Event Information.